Nothing gets your day off to a worse start than hearing your kids complain about how its so cramped in your car or compact SUV. With each of them taking turns to whine about the others either poking them or breathing on them or whatever it is and it’s exhausting. An upgrade to a minivan like the 2019 Honda Odyssey or the 2019 Toyota Sienna will greatly improve your daily driving thanks to their versatile and accommodating interior space along with their easy open and access dual rear sliding doors. Compare the specs and features of the 2019 Honda Odyssey and the 2019 Toyota Sienna below to help you determine which one is the right minivan for you. Both the 2019 Honda Odyssey and the 2019 Toyota Sienna get equipped with a standard 3.5L V6 engine but the 2019 Sienna pairs it with an 8-Speed Transmission while the 2019 Odyssey works with a standard 9-Speed Transmission or an optional 10-Speed Automatic on its upper trim levels. The 2019 Odyssey also gets equipped with a remote starter on all but the base trim level while the 2019 Sienna doesn’t come loaded with a remote starter at any trim level. 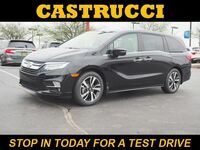 On the interior of the 2019 Honda Odyssey and the 2019 Toyota Sienna there is standard seating for seven people and the upper trim levels of both have 8-passenger seating capability. Both the 2019 Odyssey and the 2019 Sienna have easy-folding rear seats for optimal cargo and passenger versatility but the 2019 Honda Odyssey offers heated & ventilated front seats which is something the 2019 Sienna does not make available. Leather-trimmed seats come standard above the base trim level of the 2019 Honda Odyssey while you have to climb to the third trim of the 2019 Sienna for leather seats. 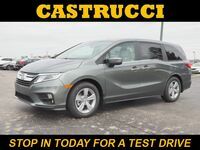 The 2019 Honda Odyssey gets loaded with an 8” touchscreen display in all but its base trim along with Apple CarPlay™ & Android Auto™ and the 2019 Sienna only offers a 7” touchscreen and doesn’t have Android Auto™ at all. With its more efficient engine along with its better interior amenities the 2019 Honda Odyssey is the obvious choice over the 2019 Toyota Sienna.